How do you currently manage your courses? Do you have one stable system in place to help you ensure everything is running smoothly? A Course Management System (CMS) can be the perfect tool to manage all your training courses from one place. This eBook shows you how to make the most out of your CMS and run your courses effectively. What Is A Training Management System (TMS)? Find out what a Training Management System actually is, and whether it’s something that could improve your training offering! What is the difference between a CMS and an LMS? Does your training business need one of them, or both? Why should you invest in a Training Management System for your training business? Here are the 8 things you need to look for in order to benefit your training organisation. Find out how to make your job easier by automating a lot of your tasks using a Course Management System! Find out the top 6 course management best practices we think you need to employ in order to maximize the effectiveness of your CMS to optimize performance. How do you know which Course Management System is right for you? Before you settle on the perfect Course Management System, make sure you ask these 8 questions to ensure you really are buying the best system for your training business! 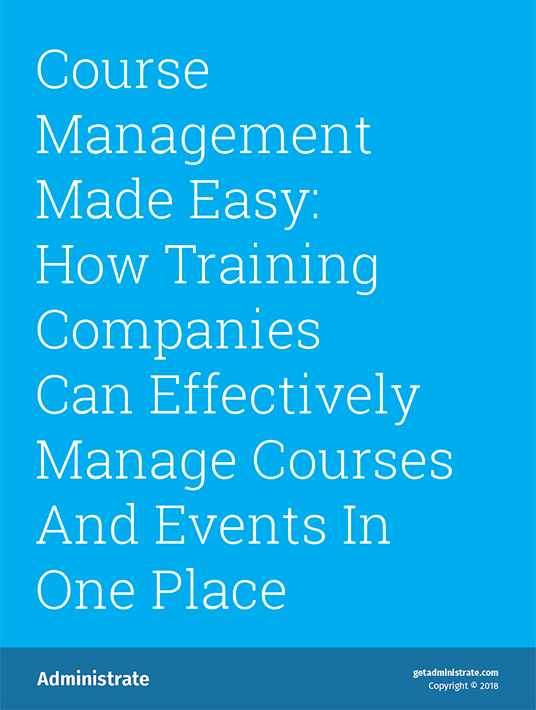 Is your current Course Management System the perfect system for your training business? Find out all the best bits about Administrate’s Course Management System, and see if it’s the perfect solution for your training business! A Course Management System (CMS) is a tool that you can use to manage all the information about your training courses. Typically part of a training management system (TMS), a CMS is where you will upload all the details about your courses so you can easily track and schedule your entire course offering from one place. You may be an eLearning professional and still don’t know how to use a Course Management System. But this is something that cannot last. You'll agree on this upon reading the eBook that Administrate has masterfully compiled. Get to know what a CMS is, how it's different from an LMS, and why a CMS and a TMS are so important. Learn about all CMS features that open organizational opportunities and benefit greatly both online learners and administrators, thus helping a course reach its full potential. Plus, this eBook offers advice on whether you need a CMS, what to look for depending on your needs, and, of course, how to achieve the desired ROI for your training company.